Like the Grand Canyon, Yosemite Valley, the Yellowstone River Canyon and select other places, Crater Lake is one of the most immediately spectacular sights in the West; hidden from view along the approach roads which climb the thickly wooded hillsides below the crater rim, the lake is first glimpsed from a roadside overlook and presents a truly beautiful vista, especially on a clear, cloudless day when the brilliant blue water reflects every detail of the sheer, jagged volcanic cliffs, bearing snow even in late summer. The remarkably rich color is a result of great depth and exceptional purity, and the crater boasts several superlatives, including holding the deepest lake in America (and the seventh deepest in the world), being one of the snowiest places in the US, and containing what is considered to be the largest body of pure water on Earth. The clarity is partly due to the absence of any sediment-bearing tributaries; instead, all water comes from rainfall or melting snow, the yearly inflow being matched by losses due to evaporation and seepage, such that the water level varies by only a few feet during the year. Also because of depth, and underwater currents, the lake very rarely freezes, despite exceedingly low temperatures and huge snowfall during the six months of winter. Up to 50 feet of snow descends each year yet the park remains partly open, and the southern entrance road is regularly plowed. In midsummer, temperatures climb to the 70s and the place is fully accessible from July to October, when most people visit, though even then visitation is relatively light, owing partly to the remote location. Crater Lake is a flooded caldera, formed by water collecting in the hole left after a series of massive volcanic eruptions 7,700 years ago. The peak that once stood here (Mount Mazama) rose to 12,000 feet, and the explosions spread ash over a 500 mile radius, leaving a crater five miles across surrounded by a rim of steep cliffs now up to 2,000 feet above the water, plus a few satellite volcanic summits; the highest point in the park is Mount Scott, on the east side of the crater. 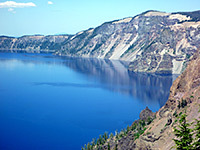 The caldera is part of the Cascade Range of dormant and active volcanoes, which stretches from Lassen Peak in north California all across Oregon and Washington to Mount Garibaldi in British Columbia. Within Crater Lake National Park are several dozen smaller peaks, plus lava flows, pumice formations, deep ravines and other volcanic features, mostly hidden away in the roadless backcountry, but the vast majority of visitors come only to see the lake, which may be viewed from all angles by a 32 mile loop road, circling the entire rim. the approach is along US 97 and Hwy 62, which crosses flat farmland for a while then enters the wooded surroundings of Winema National Forest and climbs steadily, running alongside Annie Creek, one of many streams sourced from Crater Lake, beginning as springs close to but well below the rim. 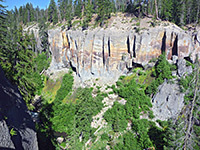 The creek forms a deep, sheer-walled canyon through colorful volcanic rocks, and may be viewed from several overlooks and picnic areas along the highway, and a 1.7 mile loop trail. OR 62 crosses the southwest corner of the national park and reaches the upper end of the canyon, where the main entrance road forks off, at Mazama Village, site of a campground (no hookups), lodge, restaurant, gas station and various other facilities. Hwy 62 then starts to descend a little, passing no more locations of particular interest, exits the park and curves back south, eventually reaching Medford on Interstate 5. The entrance road continues climbing, still through densely wooded land with no sign of the crater, but en route is one trailhead, for a loop path across a promontory between two deep canyons, plus several picnic areas, before another junction, at the south end of the Rim Drive; the nearest view of the lake is 3 miles westwards. 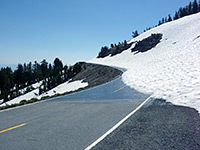 Unlike the year-round southern approach, the north Crater Lake entrance is closed by snow in winter, usually accessible only from June to October. The entrance is served by busy highway 138, from Medford in the west and US 97 in the east; a road which in the vicinity of the park crosses a flat, wooded plateau, part of Umpqua National Forest. The park road itself is similarly straight and fairly level, heading south through more woodland, interrupted for several miles by the open, sparsely-grassed flatlands of the Pumice Desert, where poor soil quality due to underlying pumice means that few plants can grow. The road climbs a little towards the end, up to a junction with the north section of the Rim Drive, from where the southern end is 23.2 miles east or 8.7 miles west. Visitation to Crater Lake National Park is concentrated along the scenic loop drive, but even here activities are somewhat limited; most people just look at the lake, from many overlooks and short trails. Because of very steep slopes and unstable rocks there is just one route down the inside of the crater to water level (Cleetwood Trail), which descends to a rocky beach on the north shore, location of the boat launch - 100 minute tours of the lake are provided several times a day during summer, circling the crater, coming close to the Phantom Ship (a volcanic pinnacle) and stopping at Wizard Island. The island is a partly submerged volcano, a secondary peak created some time after the main eruption, and it also has two trails, one to the circular crater on the summit, the other to a secluded bay. 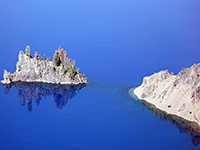 Crater Lake contains a second such volcano, Merriam Cone, but this is completely underwater, its summit 500 feet below the surface. Away from the scenic drive, most of the backcountry of the park is rather inaccessible. Land to the southeast is steep and uneven, crossed by many deep, branched ravines, and is essentially trailless, while the north and west regions are flatter but still thickly wooded, with fewer drainages. Thirty three miles of the Pacific Crest Trail traverse this area, staying away from the crater rim, though this is reachable by a connecting loop, which parallels the crater edge for 6 miles. Other sites reachable by all day or overnight hikes include the volcanic summits of Unicorn Peak and Bald Crater, and the delicate wetlands of Sphagnum Bog.